Learning how to clean a piano is a very important to enhance the durability and the functionality of your instrument. 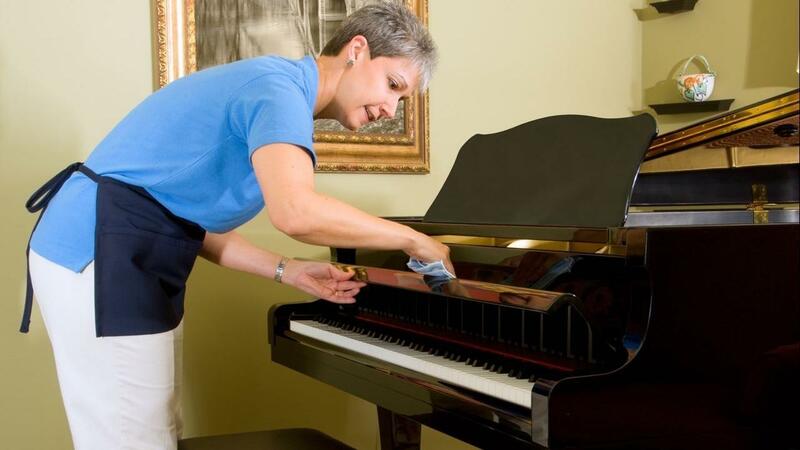 Regular cleaning will not only keep your piano clean and presentable, it will also save you time and money spent to call on a professional for cleaning and repairs. However, cleaning a piano requires the use of the right methods and products to avoid scratching or damaging the piano. If your ultimate desire is to learn how to clean a piano, you are covered! This article will guide you and provide you with useful tips on how to clean a piano with ease. These tools are used for different purposes when cleaning your piano. In-depth discussion on how to use them shall be explained in the article. *Dust your piano keys*: Dusting your piano keys is the first step you should take to clean up your piano. When there is dust in your piano, it may enter into the action mechanism or the soundboard and cause damage to your instrument. Now, this is the time to use the feather duster you purchased to dust the keys. However, the dusting process should be done gently. Apply a lower amount of pressure to the feather duster while using it on the keys to avoiding scratching the piano. Dusting off your piano should often be done to prevent dust from entering the piano. To clean synthetic plastic keys, you will probably require more cleaning products. Plastic keys are usually flat and smooth, you will need clean water with a clean white cloth, dry cloth, and cleaning solutions such as Key-Brite key cleaner. The first thing to do is fill an empty bowl with the amount of water you need, pour in a small quantity of the cleaning solution, and mix. Put a clean white cloth into the mixture. Squeeze out the water from the cloth you dipped into the solution, and gently wipe the plastic keys in a front-to-back motion. Do this continuously to avoid leaving unnecessary cleaning solutions on your keys. Finally, clean this plastic keys with a clean, dry cloth to complete your cleaning. Do this continuously until the keys are dry enough to produce a clean and sparkling effect. To use the Key-Brite key cleaner, simply hold it about 6–8 inches from the piano and spray lightly on the keys, then wipe the keys clean with a clean, dry cloth. You can also follow the steps below to clean ivory keys in case your piano has them. Get a clean white cloth. This time around you won’t dip the cloth into the water; instead, sprinkle clean water on it until it is damp. Then, clean your ivory keys with the damp cloth in a front-back motion as you did with the plastic keys. When cleaning your ivory keys, don’t clean all ivory keys together at once; rather, clean one a key at a time. Clean the key immediately with a dry cloth to remove excess water before you move to the next key. Avoid cleaning your piano keys in a side to side manner to prevent unwanted dirt inadvertently pushing into the keys. Start by cleaning the exterior of your piano with clean, damp cloth, and then with a dry cloth to keep it dry. Clean the piano gently to avoid scratching the surface. Use clothes that are not abrasive such as microfiber or cotton. Make sure the cloth is not wet but only slightly damp, since you do not want to leave any visible moisture behind. (Do this only when it is necessary.) If you want to polish your piano, begin by applying a small quantity of piano polish onto a clean, soft cloth. Rub the cloth gently on the section you desire to polish. After this is done, rub the area with a clean, dry cloth to remove excess polish from your piano. Please note that polishing should not often be done – it should only be done when it is necessary or if your piano is extremely dirty, with a few scratches that should be filled. When a piano is constantly polished, it can damage the piano finish and even the components of the action if the polish gets into the piano. Avoid using household furniture polish, silicon-based and lemon oil products when cleaning your piano. They can weaken your piano’s finish or damage the delicate parts of the instrument. Get the best piano polish for your type of piano instead. If you want to polish a lacquered piano or a high-gloss finish, super high-gloss piano polish from Cory might be the best polish for you. This product is destined to give your piano a great feel and beautiful sheen without damaging its parts. To clean the soundboard, blow away the dust and dirt that are accumulated in that region. You should be careful or even avoid this part if you are inexperienced with cleaning the piano’s interior. However, you can do the cleaning with a vacuum or a compressed air nozzle in a very gentle and careful manner to avoid damaging your instrument. Blow the dirt into a corner, where you can easily clean up the mess – and avoid touching the dampers or strings with your hands or the vacuum nozzle. You can also call on a professional to handle this aspect if you do not have the confidence and the experience to do so. Always wash and dry your hands before playing your piano. Playing with dirty hands will make your piano dirty. Keep your piano from an extremely hot or cold environment as well as extreme humidity and direct sunlight to avoid damaging, aging or fading of your piano. Don’t place substances, food, drinks, vinyl, rubber and anything that can cause damage on your piano. Make sure the lid of your piano is closed when it is not being used. When it comes to cleaning the piano, avoid the use of colored materials, as dyes from colored cloths can stain the piano keys. The use of clean white cloths is highly recommended. Avoid the use of synthetic materials and coarse cloths, as they can scratch the piano. This article has opened your eyes to ways in which you may be harming your piano, while it has also shown you how to clean a piano properly. Now is the time for you to take your piano to heart, and clean it to keep it in good working condition. Give your piano the cleaning it needs and deserves. I’m Alex Frank and I have worked in the sound technology industry for ten years now. Today, I am an affiliate blogger who likes to educate my audience more about sound technology. Visit musicinstrumentscenter.com to find all information about music that you need.